John M. Dean is a collector of diecast toy vehicles in Colorado. Hehas a large collection of toys dating back to the fifties and earlier,and in 1999 displayed some of the Jeeps from his collection here. Click on any photo below to see a larger version (20K JPEG). 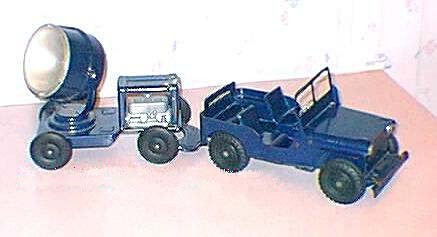 According to John, "This is a Marx (I think) pressed steel model of a Navy Jeep with search light trailer. This is a Tonka sized toy from the early 50's. I don't think the Jeep and the trailer match -- the wheels are not the same." This photo shows a 1/24 recognition model made by Dale of Chicago duringWWII. 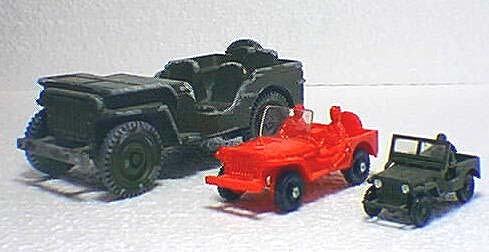 John says, "The red vinyl Jeep is also military one, from Tomte inNorway. It's a copy of something probably because most Tomte toyswere. I can't recognize what this is a copy of though. 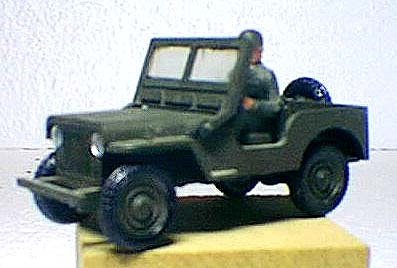 "The smallestJeep is a Siku made in Germany (see a closer photo). Siku made plastic toys until the early60's when they switched to die cast. I have a 61 Chrysler Windsor and a Mercedes Benz 190 in plastic, and I have a 63 Olds 98 in metal, so I suspectthe switch was in there somewhere." 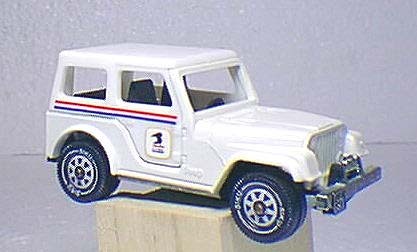 "This is another Siku -- a US Mail Jeep. The specs on the bottom say its topspeed is 123/kph and the engine is a 4 cyl 2674 ccm. "Here are three rare models of the Jeep station wagon. The smallest ofthe three is a 1/43 by Gasquy of Belgium that must be from about 1951going by the age of the Studebaker that I have by the same firm. "The middle one is by Mercury, the Italian die cast company (see a closer photo). The man I got itfrom said he got it at the Jeep dealer so it's a promo. One of John's more recent finds is a knock-off (apparently made inChina) of the Matchbox MB. 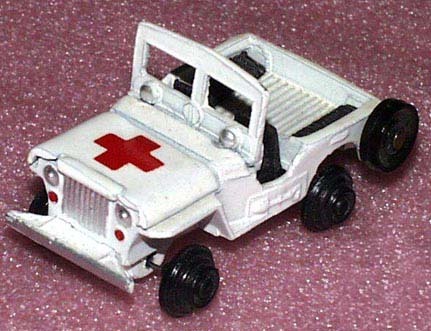 In addition to the ambulance markings, asignificant feature not found on any of the Matchbox versions is a spare tiremounted on the left side. See also a larger front view photo (38KJPEG).